Jeff Lemire is one of the rare comics writer-artists who blends accessibility and visual poetry. His graphic novels and stories tend to be about broken people with painful pasts, and he isn’t shy about having his characters just blurt out their damage. In his latest book, The Underwater Welder (Top Shelf), Lemire tells the story of a young father-to-be who is still deeply bruised by his own dad’s death when he was a boy. At one point, the man’s wife rips into him, saying she feels like he’s so obsessed with his father that he’s becoming him, and not giving his new family a chance to grow and thrive. There’s nothing subtle about how The Underwater Welder states its premise and theme: Lemire makes sure everyone gets the point. 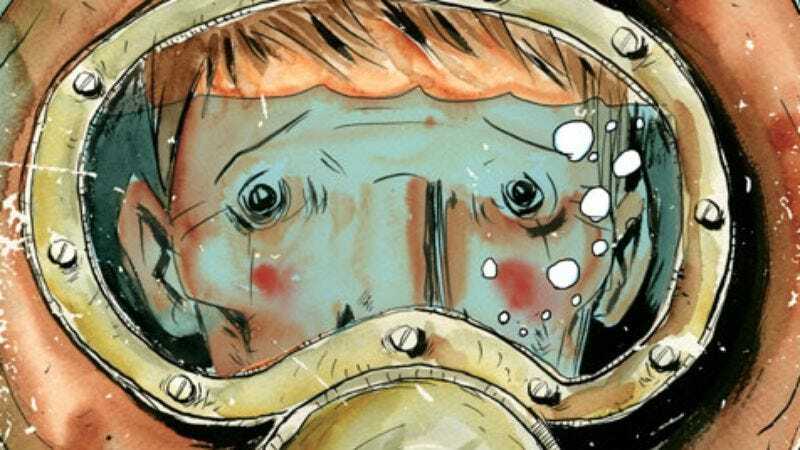 And yet The Underwater Welder is still so, so beautiful, because Lemire gets that the real measure of a story isn’t what it tells, but how it’s told. While Underwater Welder’s story is familiar and easy to grasp, Lemire’s command of pacing and his ability to come up with just the right image at just the right moment are a wonder. As soon as he introduces Jack—a deep-sea diver who works on an oil rig off the Canadian coast—Lemire zeroes in on what Jack feels but can’t fully articulate. Here’s a guy who loves his wife but fears his legacy, and wishes he had more time to sort out his problems before his son is born. But time ticks inexorably on, and that child is coming, whether Jack is ready or not. Lemire sets The Underwater Welder at Halloween, which is also the day Jack’s father drowned, on a night when Jack had dressed in a homemade deep-sea diver costume. As the book shifts back and forth between the past and the present, Lemire makes visual links between Jack and his dad, suggesting how dangerous patterns of behavior can recur. There are some supernatural elements to Underwater Welder—a visitation by old ghosts as well as some ominous portents of the future—but ultimately, those are as symbolic as the book’s title. It’s Jack’s job to fix the structural problems way down below the surface, just as it’s Lemire’s job to get readers to care about the stakes for his hero. Lemire does that with words that are sometimes inelegant, but he also does it with pictures that express what’s beneath those words. Underwater Welder builds its world panel by panel, first depicting the kind of panic that’s common to new parents, then plumbing its depths. Ed Piskor’s Wizzywig: Portrait Of A Serial Hacker (Top Shelf) has a higher degree of narrative difficulty than The Underwater Welder—and indeed, than most graphic novels. Compositing and fictionalizing the real-life anecdotes of tech outlaws, Piskor constructs nothing less than an ür-story for the put-upon people who use their computers to pull pranks and scams on their oppressors. Wizzywig’s hero is Kevin Phenicle, known—and feared—by the savvy as “Boingthump.” Piskor follows his protagonist from boyhood to manhood, as Kevin learns how to break into the earliest computer networks, and as he cycles between prison and life as a fugitive. Eventually, Kevin becomes a national story, relentlessly pursued by a pot-stirring tabloid journalist and defended by a talk-radio host who’s been his friend since they were kids. Piskor has an art style reminiscent of the ’80s and ’90s underground crowd (a little like Rick Altergott and David Boswell, in that it’s cartoony, elaborate, or grotesque as needed), and a storytelling style a lot like recent Dan Clowes, with short vignettes that add up to something larger. He’s also clearly done his homework. Wizzywig is full of fascinating tidbits about how the hero forges new identities, rips off the phone company, and gets pizza for nothing. But while Piskor is constructing an ambitious, decades-spanning tale of a genius routed by public hysteria, he never loses sight of who Kevin really is: a social misfit who becomes a criminal out of a combination of boredom, ignorance, and spite. And Wizzywig also never forgets the larger issues. A late-book reference to Wikileaks connects Kevin’s story to the question of free speech, and the story as a whole considers how crafty deviants serve to keep both governments and corporations in check. Piskor doesn’t let his hero off the hook for his crimes, but he does show real empathy for Kevin. That passion for the subject jumps off the page, making Wizzywig both an entertaining read and a powerful argument-starter. Fantagraphics’ series collecting Carl Barks’ Donald Duck/Uncle Scrooge comics and Floyd Gottfredson’s Mickey Mouse strips has already been a godsend to buffs and historians who’ve been pining for years for high-quality, comprehensive archival volumes of this material. But the latest books in both series are especially strong. Uncle $crooge: Only A Poor Old Man (Fantagraphics) is only the second of the Barks books—though it’ll be the 12th volume chronologically when the series is complete—but it contains some of the best-loved Uncle Scrooge stories, mixing the globe-trotting adventures of the stingy old “umpteen-centrifugilillionaire” with tales of his wild youth. These are the pieces Don Rosa drew from heavily for his rip-roaring The Life And Times Of $crooge McDuck graphic novel, but they’re just as rich in their original form, packed with clever plans, narrow escapes, and a lead character who enjoys amassing and hoarding his huge fortune, even though it makes him a little nutty. Give the good people at Bongo Comics credit: They know how to commit to a bit. Back in 1993, Bongo commenced a six-issue series dedicated to Radioactive Man, Bart Simpson’s favorite superhero, and the comics were numbered and plotted as though they were culled from different eras of the Radioactive Man series, thus serving as a loving parody of superhero comics through the ages. The hardcover collection Radioactive Man: Radioactive Repository Volume One (Harper Design) compiles those six issues, plus a few other Radioactive Man stories, and packages them in a form that looks almost identical to one of those $50 DC Archive or Marvel Masterworks editions, but at half the price. The comics inside are highly entertaining, finessing the complicated trick of cracking wise about the medium’s history while being as well-constructed as the work they’re spoofing. But the presentation is even more impressive, right down to a Paul Dini introduction in which he boasts about his collection of Radioactive Man memorabilia (all pictured), and talks about buying his first issue in a barbershop in 1965. The book never once breaks character.